The I20 is the perfect small, cheap to run vehicle with 5 seats it can hold up to five people and the rear seats fold down for extra space should need it (fits a bike with front wheel off easy enough). The I20 is particularly good on fuel getting 100km per 5.3 litres making it a great choice for getting round the city or to and from work. 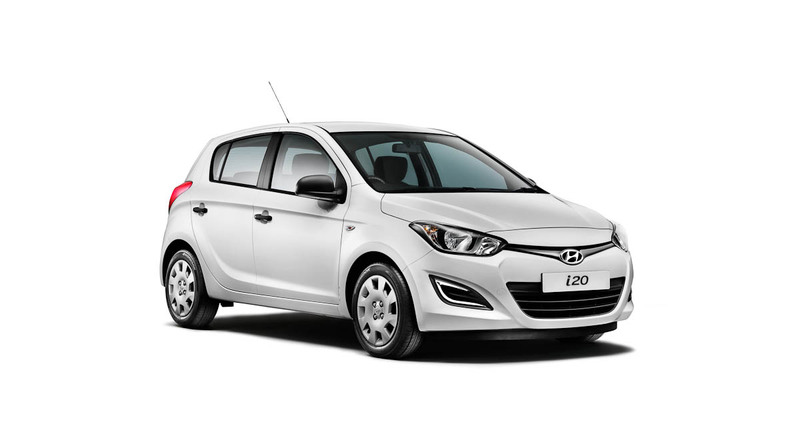 Even though the I20 is an economical hire car it still has most modern features with air-con, power steering, cd player, mp3 and often bluetooth connectivity. We are always upgrading and replacing our rental cars too ensure that we stock modern reliable vehicles and to take advantage of recent innovations in the vehicle design and features. We have been investing in the new Hyundai accent 4 door automatic sedan which is an ideal successor too our older Hyundai accents.These rental cars offer all the convenience you would want from a small car sedan, but is packed with state-of-the-art technologies, loads of comforts, advanced levels of safety and plenty of room. The rental cars have a Sleek, fluidic sculptured design with a modern, athletic and aerodynamic profile, this vehicle looks impressive. Safety is always a relevant concern for our rental cars so its no surprise that the new Hyundai Accent is a vehicle designed with safety in mind. Built safe, A comprehensive range of active safety features provide the highest levels of occupant safety. Since these vehicles are brand new and offer greater space and comfort they are ideal for longer trips where such considerations would be important. The more room allows for greater leg space and the boots space means you can generally fit your luggage with ease in the rental car. These vehicle given the brand new do cost a little more then our other smaller rental cars but they offer a whole lot more features wise.